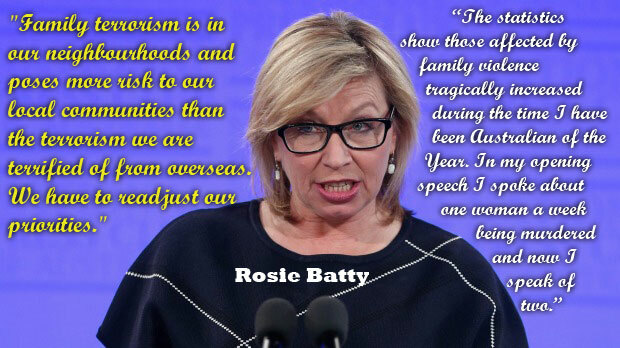 When Rosie Batty stepped down from the Australian of the year and David Morrison stepped up, albeit, with considerable controversy after his appointment, there was a consistent demand for the leadership of the country to address sexism and violence against women proactively. While this columnist has recently highlighted the current government’s continuing misogynous approach to legislative drafting, it’s time to consider in other respects how our government is, (or is not) leading the battle for change. Leadership style is a significant predictor on how any organisation will respond to issues that arise. In fact, while “trickle down economics” is a recognisable farce, trickle down culture is a psychologically generated reality. There is a premise in organisational psychology that the people in an organisation will adopt aspects of the leadership with which they are provided. It is just as applicable in the context of a national ethos as it is a corporate one. 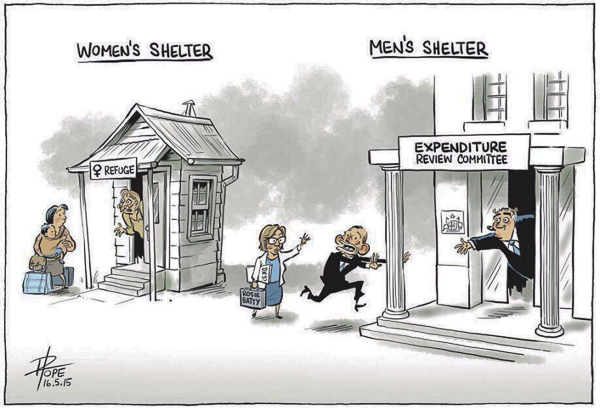 So how is it that our national leadership, protects and facilitates progress for women in our society? Malcolm’s words, to be followed by what deeds? 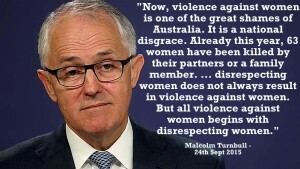 On the plus side, Prime Minister, Malcolm Turnbull returned $100M of the $300M Abbott cut from the front-line support of domestic violence issues and commented: “… violence against women begins with disrespecting women.” Turnbull then went on to admit, “this is a big cultural shift.” It was a remarkable admission from a party, which not long before, had been embarrassed by Julia Gillard’s famous speech on Abbott’s Misogyny. Lauded internationally by everything but the mainstream media, her speech went viral to the clapping of women high fiving one another – or where alone – thrusting a fist into the air. Of course, defending the charge against the leadership of the day by proclaiming Abbott was married and had three daughters and that he did not see sexist signs he was standing next to when rallying the faithful, did not help. On the first point, should not his defenders be less concerned about what Abbott accomplished for his daughters? Rather the focus should be on women who were not his daughters? 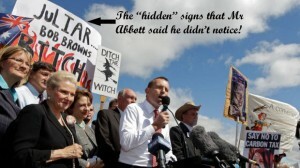 The signs proclaiming Julia as a “witch” were ironic given the controversy that would later surround Peter Dutton. Aside from ignoring the signs of the time, Abbott’s history of frequent sexist gaffes and attitudes did not exhibit leadership in support of women either before or after becoming their ministerial representative. But you may correctly point out that we have moved on from his leadership. 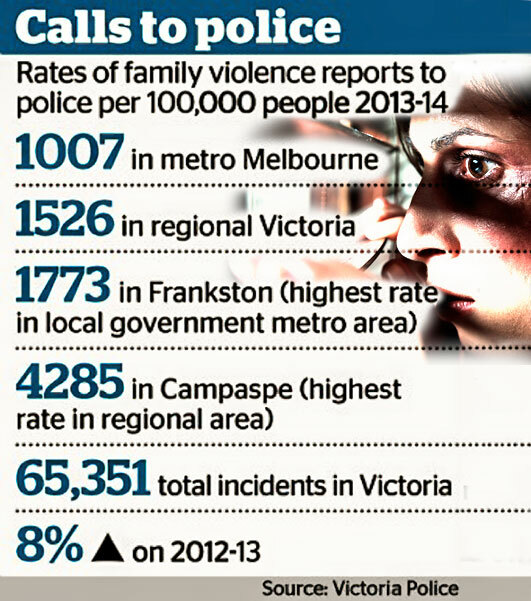 Turnbull’s reign, of course, sliced into a dreadful recent history where women in Australia had suffered violent deaths – 84 in 2014 and 79 in 2015 – most due to domestic violence. If foreign terrorists had inflicted these deaths, the government would have declared a state of emergency. Malcolm Turnbull, although, vigorously defended all of Tony Abbott’s policy decisions as evidenced by an interview with Alan Jones – the transcript of which – is on his website. He later released a Christmas Budget with changes to Medicare, Family Benefits, Day Care amongst numerous cuts that will disproportionately affect women. Initially, when Turnbull returned a third of the Abbott cuts, the funding was redirected to the placid response of alternative legal aid, police counselling, locks, CCTV & 20,000 mobile phones. Who would benefit from these offerings – security companies, police, communication providers (which was Turnbull’s last portfolio) and locksmiths certainly? 1. believe you; (disbelief was a problem previously); and. 2. put you in contact with a locksmith and security advisor to setup your CCTV. You might find a newly formed one-stop legal support group to advise you. However, they are unlikely to have experienced staff, because all experienced legal practices moved on when Abbott defunded their pre-existing services. Knowledge and intellectual capital take time to accumulate. • only 3.8% of assaulted women are hurt by strangers. In fact statistically, your child is safer with a stranger (despite the claims of stranger danger) than they are from a child’s immediate or extended family. So victims often need somewhere else to go – as do their children. 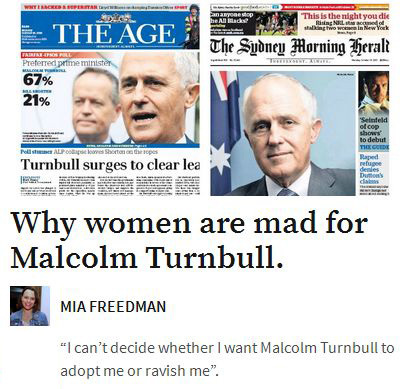 Cutting resources for safe support is therefore not showing much leadership on the issue, despite Mr Turnbull himself having successfully courted popularity amongst female voters. 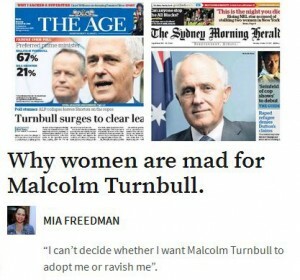 The popularity that described his efforts in terms that ranged from that of “a good start…” to Mia Freedman’s associate’s reaction of “I can’t decide whether I want Malcolm Turnbull to adopt me or ravish me”. 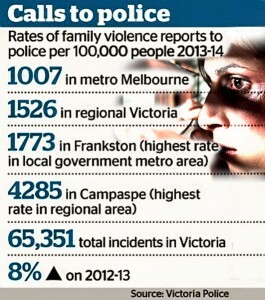 Women have expressed significant hope for the positive and well-articulated message Turnbull delivered, despite no gains in significant policy for safe support against domestic violence. 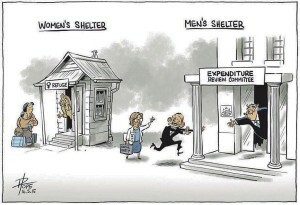 Much verbosity but a domestic violence package that was too small, misdirected and some may suggest a patronisingly political snow job to solicit loud applause simply because it appeared to be different to Abbott – despite doing nothing to undermined Abbott’s previous funding cuts. In fact, Tony Abbott has been consistently and correctly stating, that nothing has actually changed since his ejection from leadership, regarding what policy he instituted. 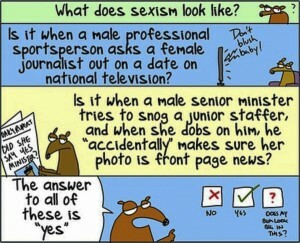 “First Dog” makes sexism clear. 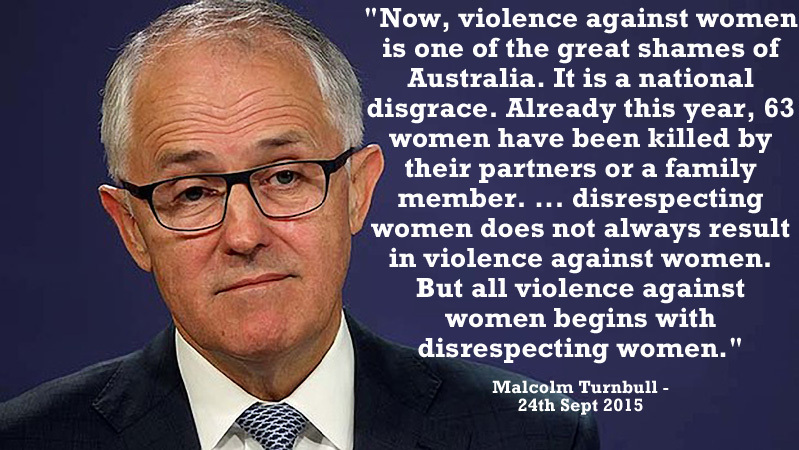 But even Turnbull’s message of strong condemnation of abuse of women has been tainted. Jamie Brigg’s unsolicited advances on a woman smack of all the hypocrisy of male privilege and misuse of power. Thankfully he was dismissed by the unanimous vote from his party brethren, including Peter Dutton. 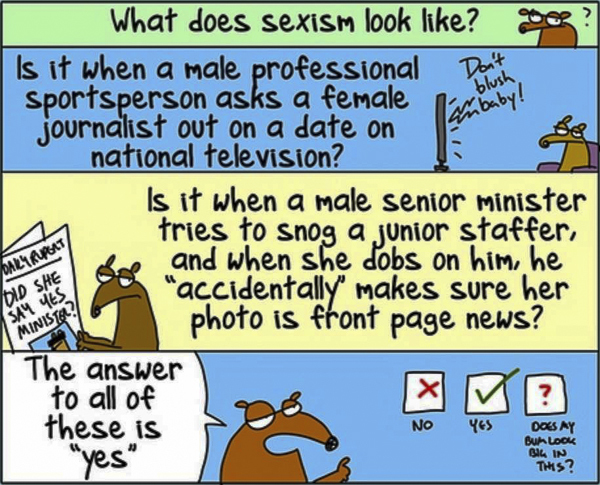 The hypocrisy of Peter Dutton’s “mad [effing] witch” text about a female journalist who dared to point out Brigg’s misogyny just reinforces the denigration. Peter Dutton’s faux pas with his texts, clearly demonstrates that despite voting with his party for Brigg’s dismissal (presumably to be seen to be politically correct), his private sympathies were for Jamie Briggs. What leadership looks and sounds like! So why does Turnbull fail to decry this behaviour amongst his ranks in an unambiguous manner that Lieutenant General David Morrison addressed the defence force over misogyny in the army? 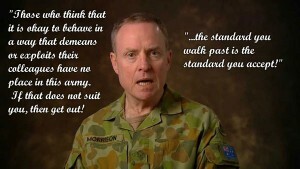 It is absolutely clear that David Morrison is completely unambiguous in his delivery of the speech – written by Cate McGregor – about what he considers unacceptable behaviour. Where as there is a great deal of ambiguity in Malcolm’s approach. He seems ambivalent, cagey and unwilling to “prosecute” his front bench. Surely it is time to be unambiguous about any sexism. Good leadership must dictate an unequivocal stance. 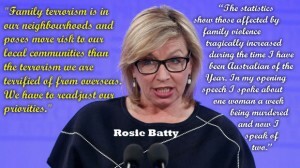 Articles reporting on Rosie Batty’s attendance at Mr Turnbull’s announcement of the return of one-third of the Abbott funding cut were expressed as a “good start” and “heading in the right direction” (perhaps in the hope they may be witness to the missing $200M being returned). However, there would appear to be no evidence from party leaders that they have even left their starting blocks on these issues. The starter gun has sounded, echoed and dissipated and it is past time that our leaders implement real progress in culture, word and deed. Without all three, Turnbull’s words remain as nothing more than the cleverly articulated whispers of empty “sweet nothings” into the ears of Australian women. Brought to you by the antidisestablishmentarianists Down Under! Powered by Justice, Truth and the underground rebellion.